There was a time when the best job in the world was working for a newspaper. That was before the "fake news" insults, before people expected all journalism to be free, before Craigslist and other websites stripped away vast chunks of revenue, before newspapers responded by slashing budgets and reporting staffs leading to what some foresee as a death spiral for print media. It really wasn't that long ago—slightly more than a decade. But in many ways, that time seems as distant as Watergate, when reporters were seen as the good guys, driving a crush of idealistic young people into journalism. Those days—the glory days of newspapers—are gone forever. But for nearly a half-century, Don Hatfield lived them, working at and running newspapers in West Virginia and Tucson. He was the editor and publisher of the Tucson Citizen—my boss—from 1986 until his retirement in 2000. The Citizen continued for nine years after Hatfield left before closing—one of the numerous victims of increasing costs, declining circulation and overly demanding corporate owners. In his new book, Hatfield looks back at his career—from his first days as a part-time sportswriter in Huntington, West Virginia, to the days he walked out of the Citizen when, he writes, the fun had started to fade. His lengthy career in two cities separated by 1,700 miles and a far wider lifestyle gulf, was remarkable. There were many highs, but far too many tragedies—both in the stories Hatfield and his staffs covered and in his own life. Like every young reporter in that bygone era, Hatfield showed up in the newsroom with a mixture of fear, awe and amusement. He recalled that a friend of his remarked that the newsroom of the Huntington (West Virginia) Advertiser was "a zoo. If you built a fence around it and charged admission, you'd make a fortune." It was an accurate description of all newsrooms at the time—an eclectic collection of strange characters who somehow bonded, thrived and excelled. Hatfield, during his time at the Tucson Citizen, took considerable ribbing about his West Virginia background. Although he wasn't part of the infamous Hatfield-McCoy feud, he wasn't that far removed. He is the great-great grandson of "Preacher Anse" Anderson Hatfield, who figured prominently in the feud. With his deep West Virginia roots, it is understandable that more than half of his book is devoted to his years working on the newspapers in Huntington. Hatfield was night editor of the Huntington paper on Saturday, Nov. 14, 1970—the darkest day in that city's history. A charted plane carrying Marshall University's football team home from a game against East Carolina University crashed as it was attempting to land in Huntington during a vicious rainstorm. It was carrying 75 people—the team, coaches, school administrators and some of the town's business leaders who were invited along for the big game. Hatfield tells of his work to rally newspaper staff members to cover the tragedy as deadline came and went. It wasn't until he got home at 3 a.m. that the magnitude of the tragedy overcame him. He had turned down an offer to go on the flight and lost several close friends. The disaster and the university's subsequent determination to rebuild its football program were recounted in the 2006 movie "We Are Marshall," starring Matthew McConaughey. Hatfield's newspaper career took a sharp and unexpected turn in 1986 when the Gannett Co.—the media behemoth that owned the Huntington newspaper, the Tucson Citizen and scads of others—asked Hatfield to move to Tucson. It was a big step up: a larger newspaper in a far larger community. Hatfield writes of the complexities of working within the joint operating agreement that bound together the Citizen and the Arizona Daily Star. It was a complex and quarrelsome relationship that was the shotgun marriage of business arrangements, and few Tucsonans ever understood it. Tucsonans will be enlightened by his detailed recollections of several stories and projects that he drove at the Citizen—and of the editors, reporters and photographers who worked with him to publish the paper. There also is plenty about the University of Arizona basketball team. Hatfield and his wife, Sandy, were rabid fans and followed the team on their national championship run in 1997. As with most newspaper publishers, Hatfield was a community leader in Tucson. And Sandy was known to many Tucsonans and Arizonans for serving on numerous boards and commissions—especially those devoted to art and culture. Don writes about many of the close friends he and Sandy had in Tucson as well as the places they loved visiting—and that one restaurant where they dined every chance they had. After he hit the Gannett-mandated retirement age of 65 for publishers, Hatfield retired in June 2000. He then became a vice president of the University of Arizona Foundation. He retired again and returned to his home state of West Virginia in November 2007. They had planned to stay in Tucson for a couple of years—but it turned out to be 22. Hatfield had hoped to publish his memoir far earlier. He finished a first draft and planned to get back to it, but it was delayed by numerous personal tragedies. Don and Sandy had a daughter and two sons. Their daughter was profoundly handicapped her entire life, and passed away as a young adult. Their sons died two months apart in 2014. Then in September 2017, Sandy passed away after lengthy battles with cancer and heart disease. Her life and more than 60 years of marriage to Don were celebrated in Huntington last September and in Tucson in last December. With his family gone, Hatfield spent several months in Tucson last winter. He hosted the celebration for Sandy on her birthday and attended several Wildcat basketball games. He has kept his season tickets. Hatfield wrote of returning to Huntington in January after that visit to Tucson. "Nothing felt the same. Nothing was the same. Nor would it ever be. No children, no grandchildren. And now no Sandy." Hatfield is thinking he may come back to Tucson this winter. 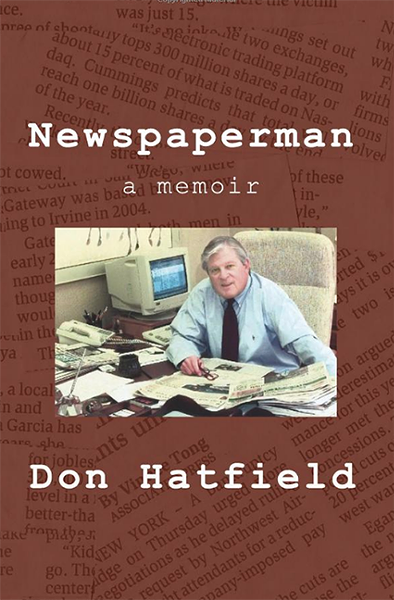 Newspaperman: A Memoir by Don Hatfield , 636 pages, is available on Amazon for $16.95.